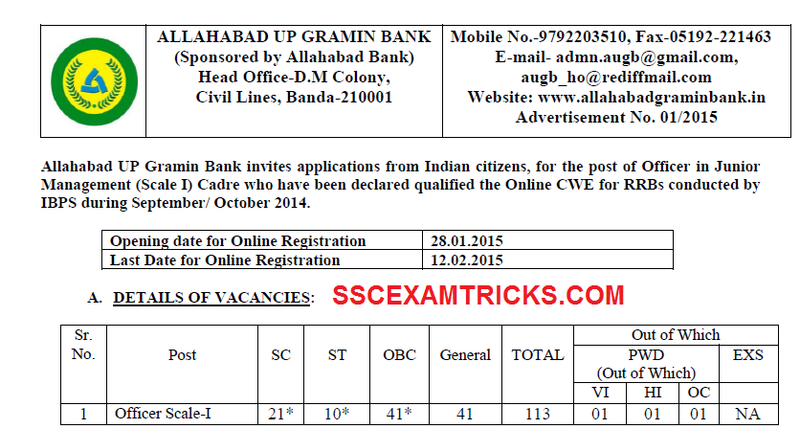 Allahabad Gramin Bank, Uttar Pradesh (UP) had released latest notification against for recruitment of 113 posts of Officer Scale I on the pay scale of Rs. 14,500/- to Rs.20,100/- on the basis of performance of IBPS CWE III held in the month of September/October 2014. ONLINE applications are invited for 113 vacant posts of Officer Scale I on the official website from 28th January to 12th February 2015. The interview will be held at the BANDA ( UP) center. The exact venue of interview will be intimated on the interview letter which will be released shortly. The interview letter will be intimated on the official website at least one week before the commencement of interview.